Hello friends! After my recent move back to Ukraine I’ve been rather busy trying to organize and set the perfect craft space for myself. 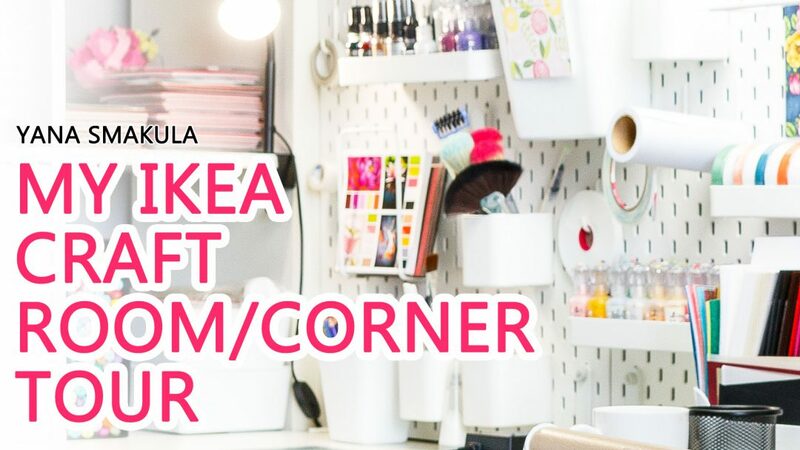 I’ve shared a video almost right after our more (WATCH IT HERE ON MY YOUTUBE CHANNEL) and showed you the state of my craft corner; I mentioned I was planning to go to IKEA to pick up a few more furniture pieces to complete my organization. 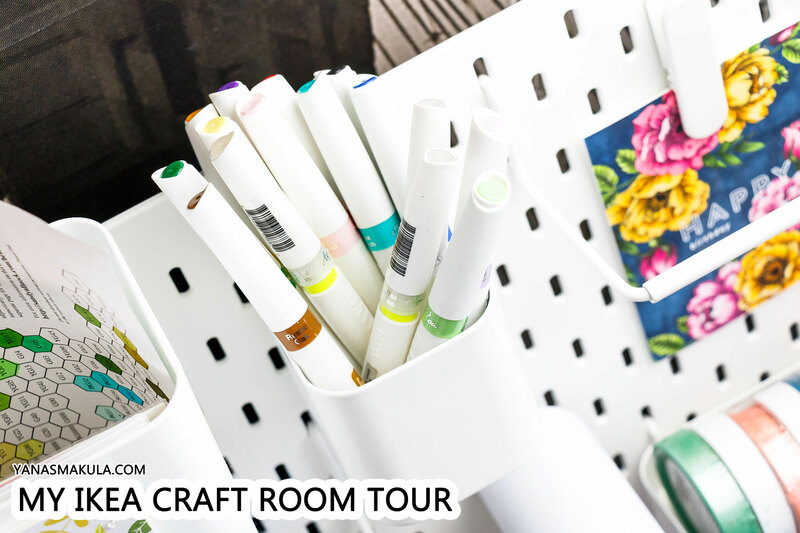 I’m happy to report that I’ve purchased, installed and filled them to the brim with my favorite craft supplies! You’ll notice I don’t have a lot of supplies. My philosophy is – Less is More. I find it easier to create with a few, but truly favorite supplies. I purge once or twice a year to keep my clutter under control. 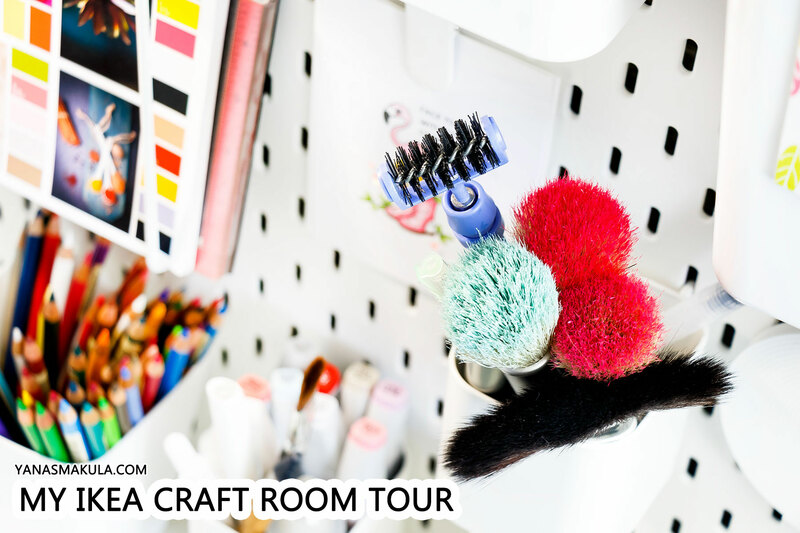 In this post I’m sharing a detailed look at my craft corner/craft room furnished using IKEA pieces. I hope you’ll find this info useful for your own craft room/corner organization. Like this video? Please give it a thumbs up (you can do so on Youtube video page right under the video) and share with a crafty friend! Leave me a comment too, I love hearing from you! 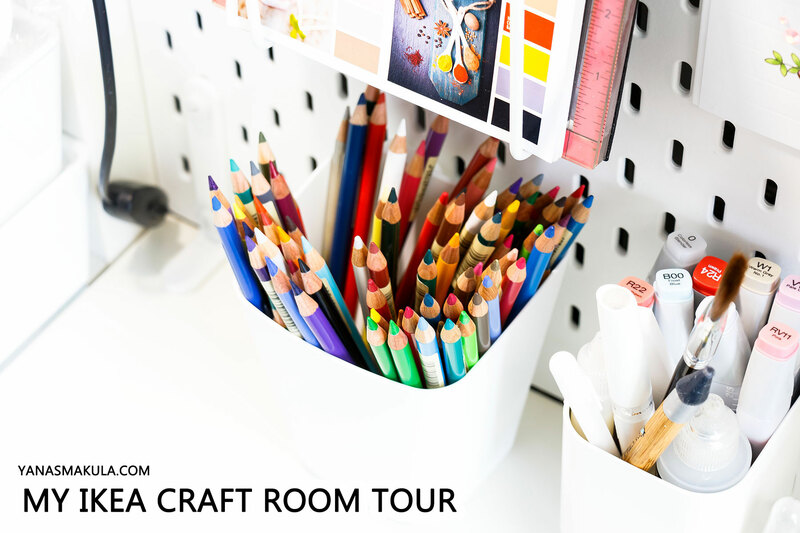 My craft corner is situated in our bedroom. 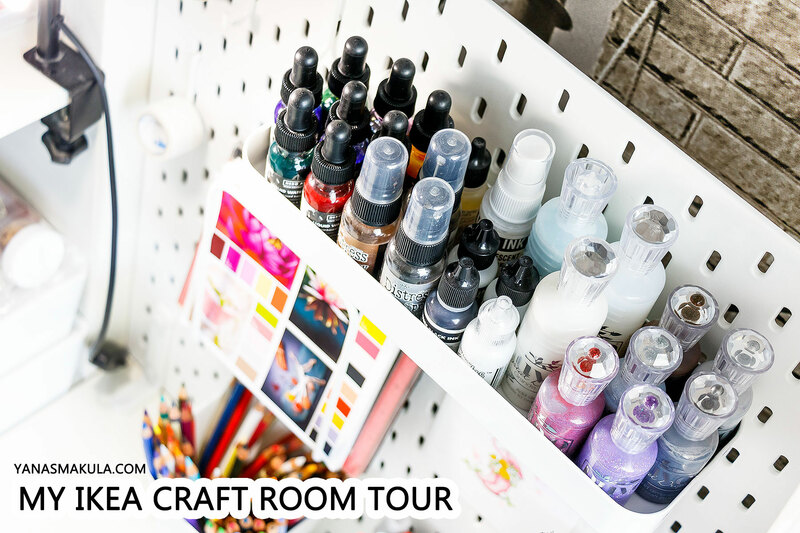 I don’t have a dedicated room for my craft supplies, but rather only take up a corner in the bedroom. 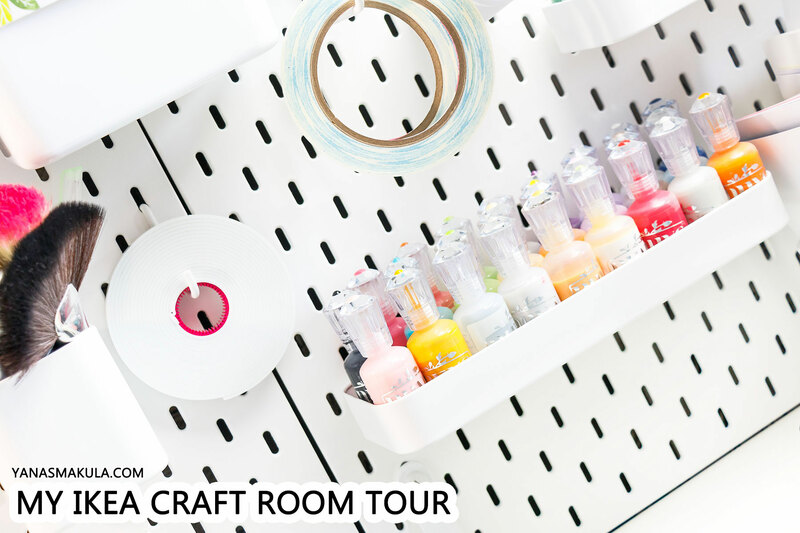 Because of this I wanted to keep my craft space as neatly organized as possible and beautiful at the same time. 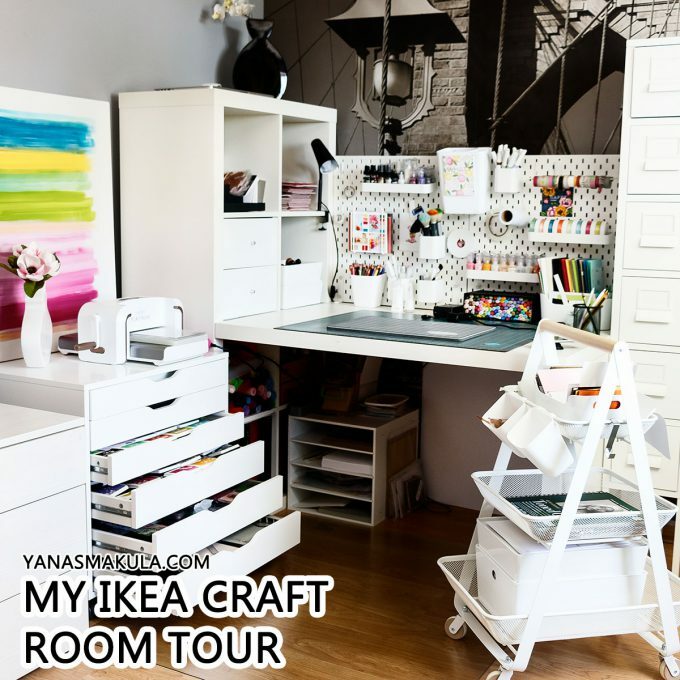 My main desk area is an IKEA KALLAX workstation 190.465.50 (in white). This is an older model which I purchased 5 or so years ago. IKEA still makes this workstation, but it looks slightly different (table legs are different). 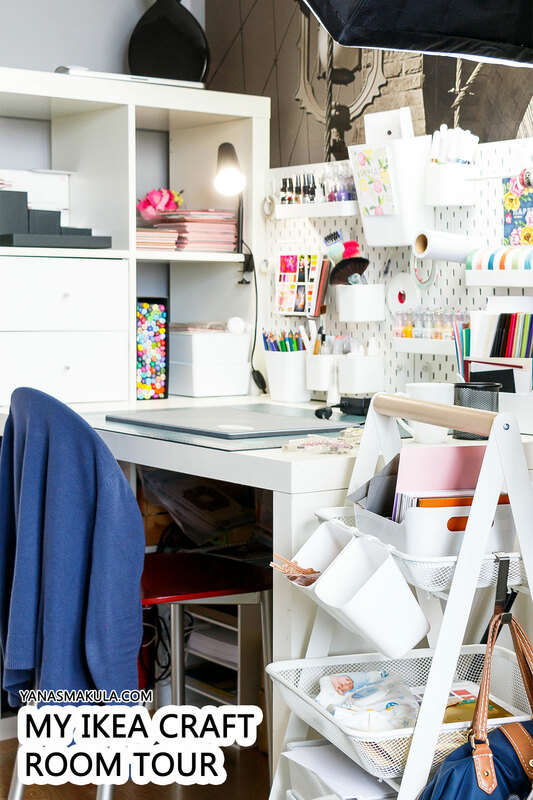 I love the big desk – it’s nice and wide, I have plenty of space to craft, film and even work on multiple projects at a time. I don’t like the KALLAX unit itself as I find it to be a waste of space in a way. The cubes/compartments are too deep for me and I hardly ever utilize the entire depth of the cubes. I store my scrapbook albums in the bottom cubes (back from my scrapbooking days), felt and some paints. The cubes above the desk are mostly empty. I have 2 drawers in one which are currently empty (they don’t quite work for me as I often have my tripod sitting on my desk and it prevents drawers from being fully opened). I have plastic containers with my ink blending tools, my 6×6 cling background stamps and an empty desktop organizer sitting in other cubes. Plus it saves me from having to drill holes in the wall – I have photo wallpaper on the wall behind my desk which I’d rather not put holes in. I also have a deep ALEX drawer unit401.962.41. It sits to the left and holds all of my essentials. If needed, it can be rolled and hidden under the workstation. On top I have my Platinum Die Cutting Machine from Spellbinders, my heat tool as well as some pretty decor. 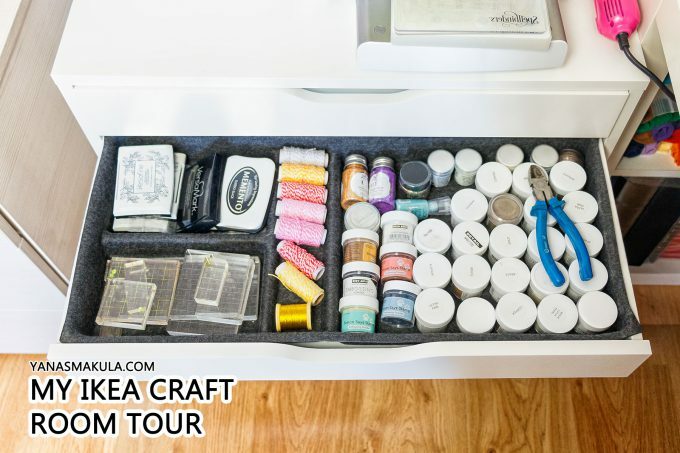 The two top drawers have dividers which help me organize my space. Top drawer divider is KUGGIS 002.802.08, it doesn’t perfectly fit in the drawer, but it works for sorting and organizing small things. 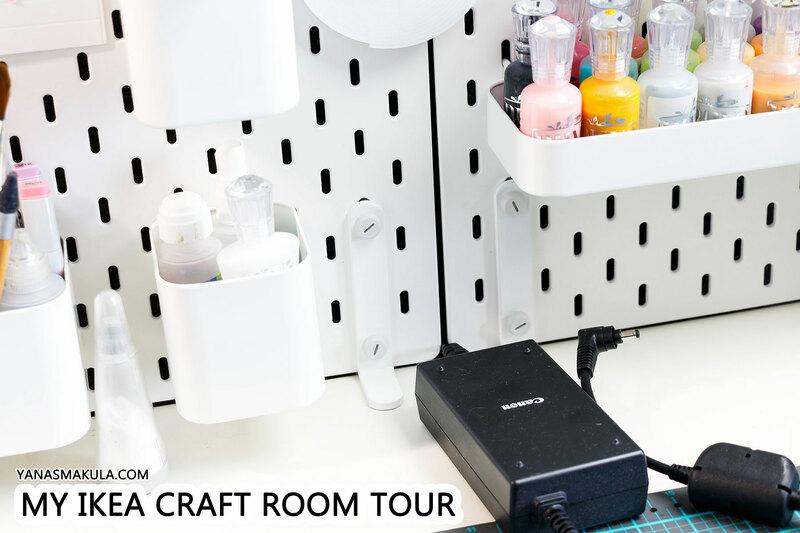 Second from the top drawer has a different insert – EKET 303.543.30, it organizes my embossing powders, most used inks and clear blocks. 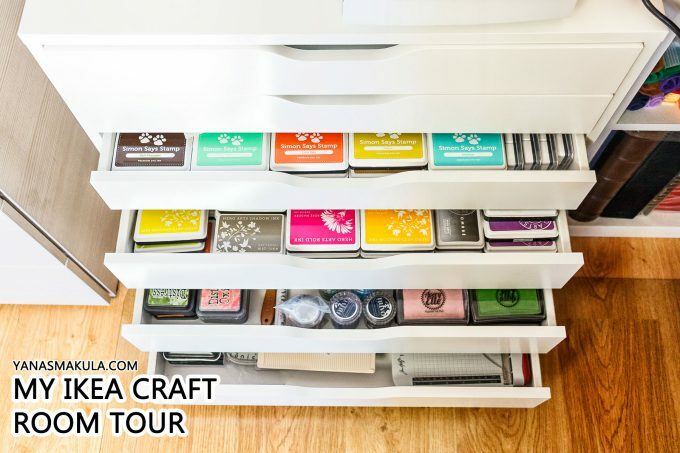 The 3 drawers following hold my most used inks – Simon Says Stamp, Hero Arts, Aver Elle & Distress. Bottom drawer holds my most used tools – paper cutter, scoring board, stamp platform. I have a RISATORP cart 202.816.31 off to the right. It holds all of my papers as well additional removable containers for bits and pieces 503.037.35. Behind it stands a tall skinny metal unit that holds all of my stamps and dies (actually, it doesn’t hold all of them, but that is that it is filled with). 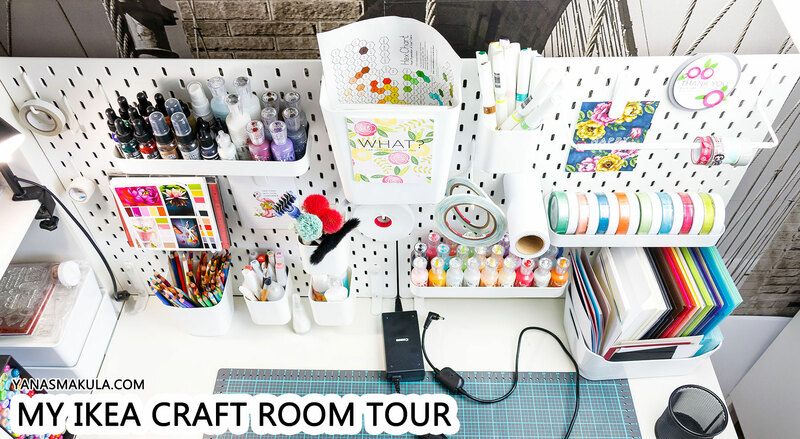 How is your craft room set up/organized? 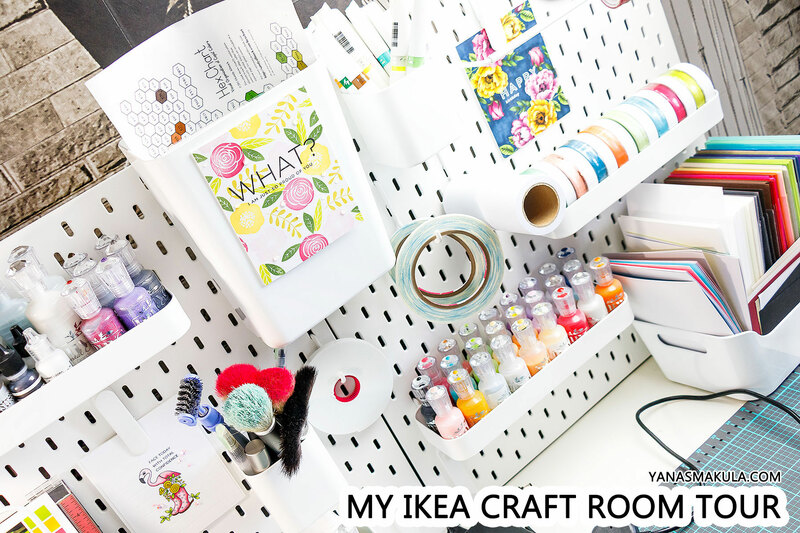 Is there an IKEA piece that works really well for storing organizing something in your craft room? Share below! Save this idea to one of your boards on Pinterest for later! Wow! What a great space you have! You have packed so much into a small space. 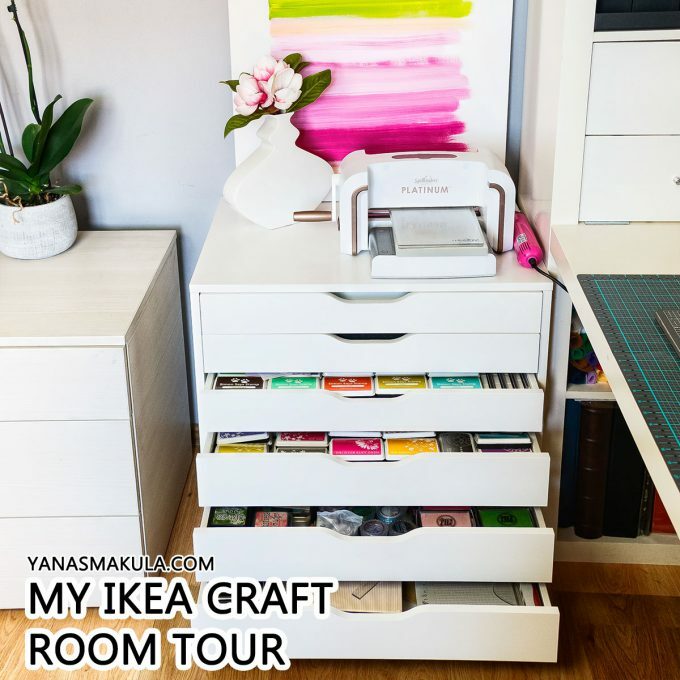 IKEA solutions are the way to go for crafters. Thank you for sharing. 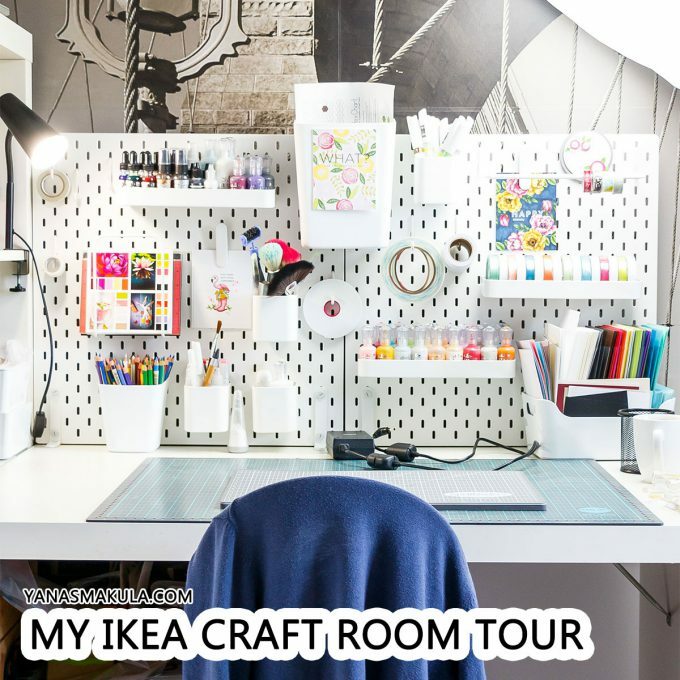 I love your mini craft room. Is the tall skinny metal unit an Ikea item as well? Thank you for sharing. Wonderful tour, thank you! Will be on the lookout at Ikea for the Alex organizing units. Would love to know the name of the one you think is for a closet unit. IKEA has inserts for Kalax/Expedit: two-drawer unit, divided shelf, etc. Love your cart – it’s a Risatorp. The Kallax is on my wish list, I love the large one!! The Kallax wire baskets double the storage space. Awesome creative space and wonderfully organised. 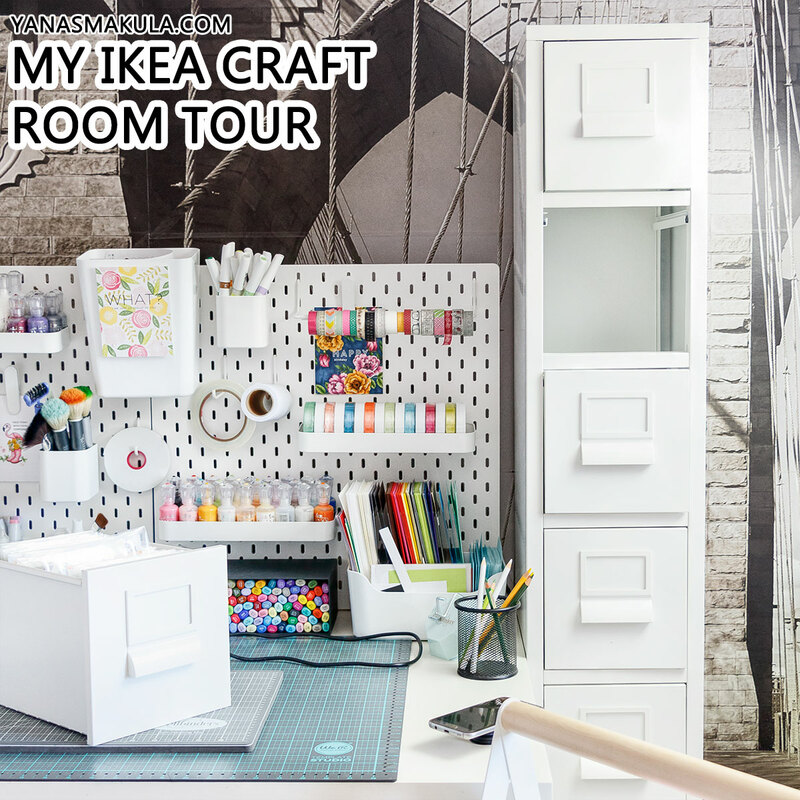 Love the peg board idea and your tall skinny unit is fab too. Is that from ikea? I feel so guilty. I have 3x the space, and am no where nearly as organized. Ugh! You are amazing! Very nice and uncluttered, that’s the best way to have it. I have a whole room but reorganize fairly regularly. I love your tall drawer unit, I take it that too is Ikea? Yana, I moved from CT to FL just a yr ago. 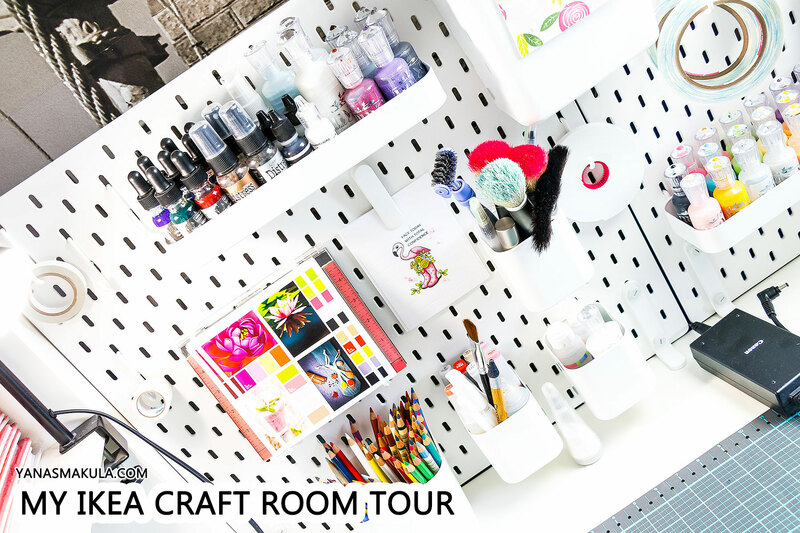 I had an entire 2nd floor I remodeled w/friend into my crafting space; 900+ sq ft of brand new craft heaven. Made major life changes and now my craft space is a fraction of what I had. I have been trying to figure out what and how to organize. Thank you for your tour as I have finally decided to completely go IKEA! You gave me wonderful ideas that will fit perfect. I am sad about the talk cabnit you have for your stamp is discontinued. That was a perfect solution for my stamps. That is one thing that I was trying to decide how to store. But I love your space and again thank you for the wonderful ideas. By the way I have subscribed to your emails and you tube for awhile and love your videos. Have a blessed day. I have a very small room now – I wish I knew about the Ikea solutions when I did my room. They would have worked way better than what I have used and it is all so pretty. I love it all in white. The softbox is just one of those standard boxes sold on Amazon – search for Studio Lights and you’ll see a bunch of options. It is all very nice, but I tend to wonder why everyone has Ikea? They are quite expensive. For my budget. Is there an alternative place to buy things like this that is not as expensive?